The three National Research Ethics Committees (NEM, NENT and NESH), covering all fields/disciplines, were established by the Norwegian Parliament (Stortinget) in 1990. 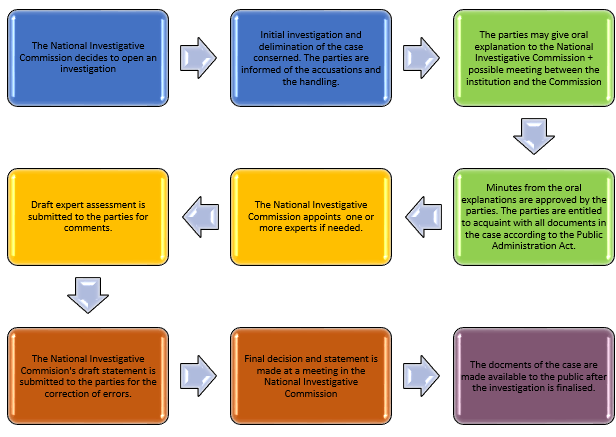 In 2007, the Research Ethics Act provided a legal mandate for the three committees together with the establishment of the National Commission for the Investigation of Research Misconduct. With effect from 1 January 2013, the Norwegian National Research Ethics Committees (FEK) were established as an independent administrative agency. In 2017 a new Research Ethics Act entered into force. Under the Act, research institutions (universities etc.) have the primary responsibility for the teaching and training in research ethics and research integrity, for preventing research misconduct and for handling such allegations. Independent body under the auspices of The ministry of Education and Research. Cases concerning breaches of recognised norms of research ethics should usually be dealt with at the local level. If the local level concludes that a researcher has committed research misconduct, the researcher may appeal the conclusion to the National Commission for the Investigation of Research Misconduct. In addition, the Commission can launch investigations on its own initiative. The Commission covers all research fields and deals with research carried out by Norwegian research institutions private or public. It can also investigate cases abroad if the research has been carried out by researchers employed by a Norwegian institution, or if a substantial part of the funding stems from Norway. The Commission is composed of seven members and four substitutes all nominated for a period of four years. The Commission often draws on external national or foreign expertise when handling cases. The responsibility for sanctions rests with the research institutions. The Commission gives advice to individuals and/or research institutions and act as a knowledge base, i.e. gather information concerning research misconduct in Norway and beyond. All institutions are obliged by law to report to the National Commission about handled cases. The Commission is cooperating with similar organizations abroad. On the national level, the Commission cooperates with the National Committees for Research Ethics, especially on prevention of research misconduct. The National Committees for Research Ethics have published National guidelines on Research Ethics (including research Integrity) since the beginning of the 1990’s. The guidelines have been revised regularly, latest in 2016. Researchers are obliged to know and to follow the guidelines, and they constitute the baseline when investigating allegations of research misconduct. The National Committees and the Commission publish annual reports about their activities. The Research Ethics Committees (including the Commission) has a website (www.forskningsetikk.no) with comprehensive information about Research Integrity. A Research Ethics library containing articles and cases (including on research integrity). This is an online resource for research ethics/integrity education available on the website (www.forskningsetikk.com), also in English. A yearly conference for teachers and people responsible for research integrity at the different institutions. The secretariat for the Committees takes part in a wide range of teaching activities at different institutions. The National Guidelines for Research Ethics (including RI) are very important when it comes to promoting good research practices. In addition, FEK publishes the magazine Forskningsetikk with four issues per year, and books, reports etc that are available for free on the website www.forskningsetikk.no.